New from Battlefield Legends! Now you can recreate the great battles of WWI with these highly detailed 54mm cavalry sets from Armies in Plastic. 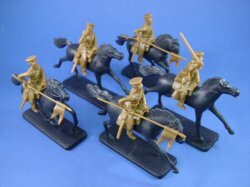 This set of WWI British Lancers includes 5 figures in 3 poses with horses. Figures are cast in khaki and are ready for play, display or painting. A terrific set of highly sought after figures! Collect the entire set today including British Infantry, British Lancers, German Infantry, German Uhlans, French Infantry, US Army Infantry "Doughboys" and more. 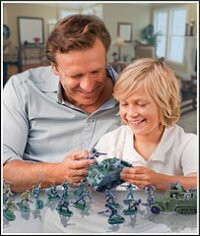 Recreate the great battles of WWI with Armies in Plastic!